E.L. Doctorow made the following remarks at the 2013 National Book Awards ceremony, where he received the NBA’s Medal for Distinguished Contribution to American Letters. Before coming here this evening, I thought to say something about what is lately on my mind—what is on all our minds, whether we know it or not—something that has swept through our lives and taken us up in ways that are useful and even spectacular, but also worrisome—and so ubiquitous and loomingly present in everything we do: the way we communicate and take care of ourselves and find things out and look to be entertained. Well, that would have to be the Internet. So to begin, I want to congratulate those short-listed content providers here this evening. The World Wide Web was conceived as a somewhat academic resource some years ago, but its years of development since the 1980s have seemed to me the work of a moment, coming into being with the force of an astronomical event. Here was this virtual world, a companion planet in orbital swing with our own. And its stuff, its substance, was not mountains and seas and deserts and melting icebergs, but information, data, knowledge in every form, of every kind, transmitted for every purpose, personal, governmental, commercial, educational, political. It is a companion world mined to create wealth, to educate, to bring news, to spy, to save lives, to make war. But my odd sense of it as something that exploded instantly into being has to do with a population putting itself eagerly into its arcane service, as emigrants swearing fealty to a new world—the techies, the programmers, webmasters, security experts, hackers—as if, with its appearance, it created the people necessary to maintain it. And you wonder, what if there was no Internet, what would these people have done with their lives? It was as if they were born for the virtual, so promptly and efficiently did they bond with it, work out its kinks and deduce its possibilities. And this world of theirs is a world of simulation, clearly evidenced by its language. Never mind that text is now a verb. More radically, a search engine is not an engine, a platform is not a platform, a bookmark is not a bookmark, because an e-book is not a book, and a cookie is not a chocolate chip cookie. Cloud is something that may be somewhere in the sky, though not to produce weather. Surfing, an activity with neither a surfboard nor waves to ride. So language has been stolen or, more charitably, metamorphosed. We in this room especially have to appreciate metaphor. We're the descendants of writers who saw the sun as Helios' chariot riding across the sky. And yet… when was the last time, hearing the word mouse, that you thought of a small gray rodent? Or heard the word web and thought of a spider? Emerson said "all that can be thought can be written…. Man is the faculty of reporting, and the universe is the possibility of being reported." So Emerson would appreciate the Internet. The universe as the possibility of being reported suggests endless ascription, infinite surprise. And he might, after a drink or two, think of global Internet activity as a kind of Oversoul. For my part, I think less mystically, of an Overbrain. You will find in the relevant Wikipedia entry a visualization of routing paths through a portion of the Internet. What makes the picture uncanny is that it might easily be mistaken for a cross section of the human brain. So, can we expect from the Internet's meta-brain infinite manifestations of human genius and human perfidy? I think so. It is a complex structure, available to all sorts of applications and misapplications. Like any web, it can wrap itself around you. If there's an algorithmic breakthrough that shows us how to reduce pollution, for example, there is also an algorithm for the quantification of persons into data. Wherein everything we do, our predilections, our relations with others, our physical qualities and psychic conditions, our political beliefs, what we buy, what doctors we see, what movies we watch, what books we read, if any—anything and everything about us broken down into data, the life substance of the companion world in cyberspace mined in invasive expeditions in the name of commerce and government surveillance—for the use of corporations and excited police departments. You can call it quantification—in the 1960s, we called it reification. A means of dehumanizing. And it turns out that the prophetic story for all of this is, oddly enough, that eviction story from the Bronze Age telling of the consequences from eating the fruit of the Tree of Knowledge. So like all worlds, the virtual comes with its heaven and its hell. century. Norris despaired of the Western Union telegram—the Twitter of its day. He feared it was the end of literary discourse. If people could express themselves adequately in ten words, the human mind would eventually be inaccessible to works of 100,000 words. But Norris also believed the typewriter was an enemy of creativity. We don't want to be today's Norrises, silly fellow that he was (as there are those today who think writing on a computer means the death of great fiction). Writers thrive on adversity and always have, since God stopped writing and humans took over the task. But there are Internet dynamics that do challenge us. In fact, as concerns interactivity, one of the web world's waving flags, the techies don't want to know that reading a book is the ultimate interactivity, where the reader's life flows through the sentences, as through an electric circuit, animating those sentences, bringing them to life in the mind—so that it is only when a book is read that it is completed. Nothing else is as interactive as that. And a book is written in silence and read in silence, another advantage in our noisy world—an integrity of the mind is maintained with the ability to live in an extended discourse. No, that isn't the major problem. Nor is it the digital undercutting of authors' copyright and the pirating of texts, equivalent to what has happened to musicians… though that is a problem. You may have read a few days ago the results of a survey conducted by PEN: not only that American writers worry about being the target of government surveillance, but that "a significant portion of writers are engaging in self-censorship by avoiding research on certain controversial topics, choosing not to engage in sensitive conversations, and declining to pursue particular topics and stories when doing so might lead to scrutiny by the US government." So it has begun. That slowly gathering, ghostly darkness coming off the otherworld technology. A kind of China-like darkness, maybe. Or call it a first look into the Internet world's hell. It's hard to believe as we assemble here this evening, a flourishing example of Western democracy. But the struggle has begun as to who will rule that webby other world—government data miners and the corporations in step with them, or everyone else? We'll have to pull ourselves together and, reluctantly or not, join that struggle. I don't have to remind us that everyone in this room is in the free-speech business. Thank you for your kind attention, and my congratulations again to the wonderful short-listed writers here this evening. Last month, David Cole wrote about how we should be concerned about the NSA spying not only domestic targets, but foreign targets too. E.L. DoctorowE.L. Doctorow was the author of twelve novels, four short-story collections and numerous books of essays. 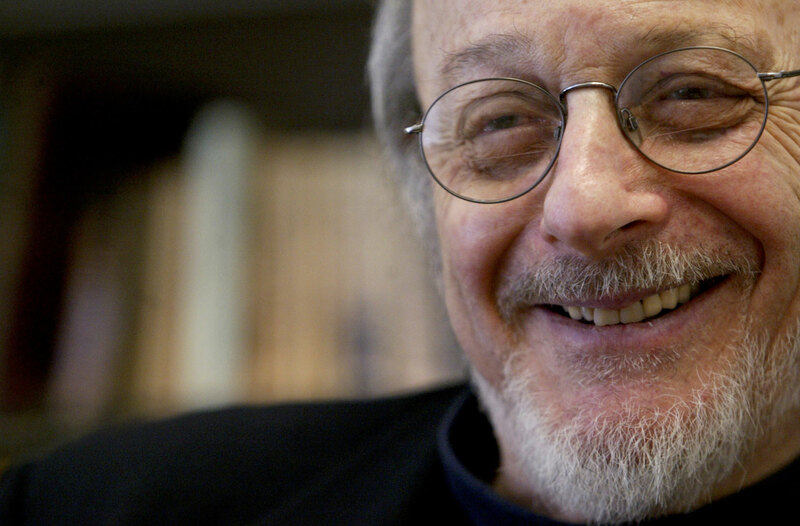 Doctorow wrote regularly for The Nation for more than thirty-five years. His essay, “Home,” appeared in our 150th anniversary issue. His final novel was Andrew’s Brain (2014).